This was a day trip to the Capital Region to check out the Tri City Valley Cats home game against the Oneonta Tigers. As a bonus on this night, we were able to watch Koby Clemens, son of Roger, play his first game for the Tri City Vally Cats. He had already spent part of the season in the Appy League, and had been called up to Tri City that past week. The place was PACKED as Koby's dad was in the stadium to watch his son play. We started the evening out by having dinner at 'Smokey Bones' in Colonie. Great chicken nachos! Headed to the game after dinner. 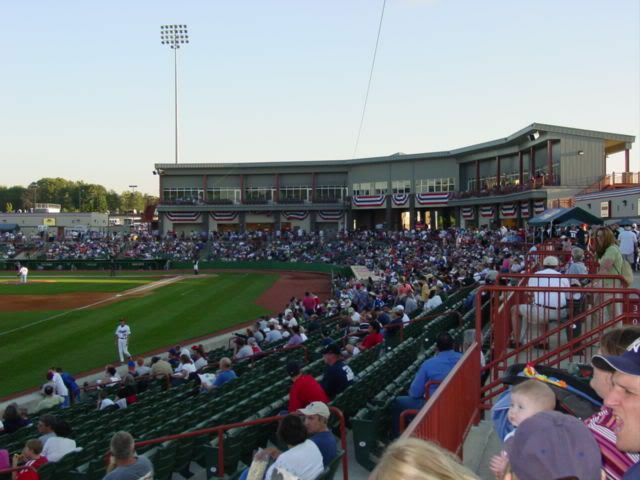 As has been the case with the other two NY-Penn League games we've been to, parking was free at this game. 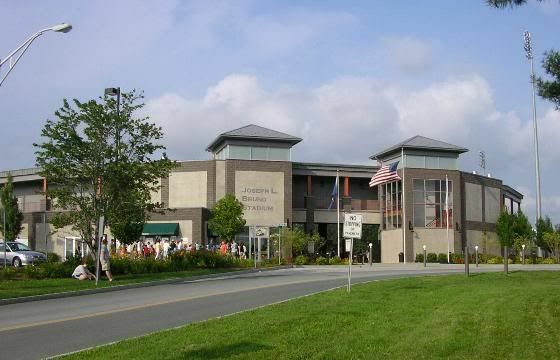 The stadium is situated on the campus of Hudson Valley Community College. Main concourse with concessions and all is located directly behind the seating area, and the skyboxes are above that. The seating extends from left field all the way around to right field, but the rows only number 15 all the way around keeping the fans very close to the action on the field. The concession 'options' are the most plentiful when compared to any other minor league park we've been to also. A great time, worth the two to three hour drive from home. Another Clemens making his way up the ranks! There was a buzz in the air at Joseph L. Bruno Stadium on Thursday night, and not because the first place Oneonta Tigers were in town. With Roger Clemens on hand to watch his son Koby make his Tri-City debut, the ValleyCats split a double dip with the Stedler Division-leading Tigers, winning the opener 4-1 before dropping the second game 2-1. With an energetic crowd of 5,034 cheering them on, the 'Cats built an early lead in the opener of the twin bill. With one out in the first inning, starter Jay Sborz walked Tommy Manzella, who then stole second base and scored when Matt Cunningham knocked a sharply hit double down the right field line. Tri-City extended its lead in the third off Sborz. With one out, Neil Sellers walked, moved to third on Cunningham's second hit of the game and scored on a wild pitch by Sborz. Two batters later, Jordan Parraz made the score 3-0 with an RBI hit through the left side. ValleyCats starter Sean Walker gave up four hits and walked four in his 4 1/3 innings of work. He only surrendered one run, a solo homer by Ryan Roberson, but had to work his way out of jams in almost every inning. After walking two in the fifth, Walker gave way to Adam Knobel. Knobel handed out another free pass to fill the bags, putting the go-ahead runs on with just one out. With the game at stake, Knobel bore down to strike out Justin Justice and Cory Middleton back to back, keeping the 'Cats ahead. Tri-City got a little more insurance in the fifth from newcomer Clemens, who started at designated hitter in his first class A game. With Mark Ori on third base, two outs, and his father watching from a luxury box, Koby ripped a pitch into the hole at shortstop. Middleton got his glove on the ball but could not make a play, allowing Ori to score the fourth run. That would be all the ValleyCats would need, because Adam Knobel was fantastic. Despite walking four, Knobel did not allow a hit in his 2 2/3 innings of work, and struck out six Tigers. Knobel closed out the seven inning game to pick up his second win of the year and lower his ERA to 2.70. Sborz took the loss to fall to 1-2. The 'Cats fell in the second game due to some outstanding work from Oneonta starter Matt Norfleet. Making his first professional start after being drafted by the Tigers this year, Norfleet was nearly unhittable, allowing only Tommy Manzella's first inning infield hit to second base over six innings of work. After giving up that hit, Norfleet retired 13 straight until Clemens stopped the streak with a walk in the fifth. Norfleet needed to be that stingy, because Tri-City pitching was nearly as good. The Tigers got an unearned run in the first inning off Tip Fairchild. 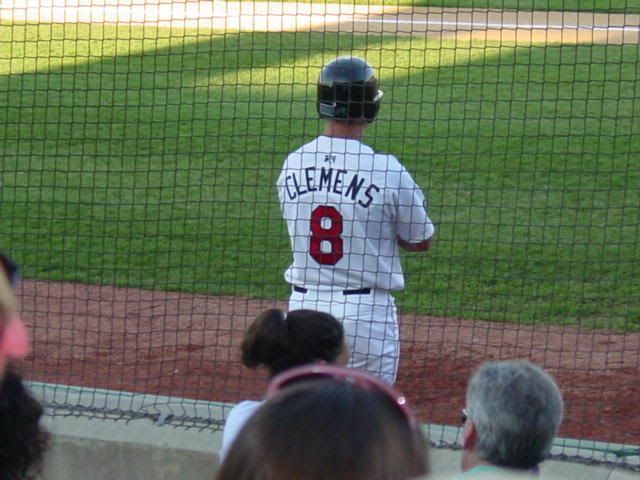 Michael Hollimon doubled to left field after having his at bat extended when Clemens dropped a foul pop at third base. He scored one batter later when Jeff Larish knocked a two base hit into the right field corner. The score stayed 1-0 for a while, as Fairchild settled down, allowing four hits and strike out five in his four innings of work. Brian Bogusevic came out of the pen and worked the fifth and sixth without allowing a hit to the league's top scoring offense. Brandon Stricklen came in to pitch the top of the seventh and gave up a costly insurance run. William Rhymes doubled to left to score Rafael Mendez and make it a 2-0 game. The 'Cats nearly came back in the ninth. Gibbs Wilson relieved Norfleet and worked himself into a mess by hitting Cunningham and walking Ori, putting the tying runs on with one out. Jordan Parraz came through with a ground single to left to score Cunningham, cutting the lead to 2-1 and moving the tying run to second base. Koby Clemens struck out looking, however, and Eric Cavers rolled into a 6-4 forceout, allowing the Tigers to escape with a slim one run victory. Norfleet moved to 3-1 with the win, and Wilson picked up his first save. For the second straight night, Roger Clemens signed autographs after the game for numerous ValleyCats fans, who turned out in force to see the future Hall of Famer and his son. The 'Cats will continue their series with the Tigers Friday night at Bruno Stadium, with first pitch scheduled for 7 p.m. Friday is also Italian Night at the Joe, and fireworks will be set off after the game courtesy of Price Chopper. Gates open at six.